Oftentimes, the emotional upheavals triggered by fluctuating hormone levels during the menopausal transition can be stressful for women and their partners alike, leaving both parties wondering how to handle mood swings within their relationship. Read on to learn more about the symptom and advice on how to deal with mood swings in a relationship so that you can work together towards better communication. Mood swings are defined as extreme and abrupt changes in mood that can trigger emotional reactions mismatched to the reaction's trigger. Those who experience mood swings report feeling like their emotions are on a pendulum, constantly swinging from one extreme to the other. Mood swings are mainly caused by fluctuating levels of estrogen, which is responsible for controlling the brain's serotonin levels. Serotonin is a mood manipulator that is a major player in emotional stability. 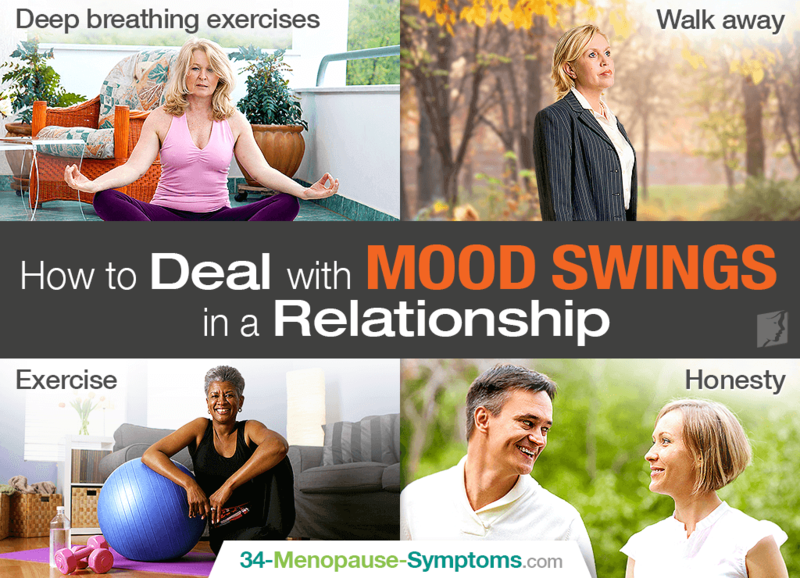 Although common during this phase of life, mood swings can be difficult for people to cope with. Although the situation can seem upsetting and frustrating, it is important to remember that menopausal mood swings are a normal part of the transition into infertility, and there are effective ways for all parties involved to deal with them. Deep breathing exercises. Try practicing breathing techniques if you can feel yourself becoming irritable. These will keep you mindful of the present moment and more in control of any adverse reactions you are about to commit. Walk away. In stressful or hectic situations, excuse yourself momentarily and give yourself time to regain composure. This will help ensure you don't say things you don't intend in the heat of the moment. Exercise. Everyone knows that exercise has a huge range of benefits, including helping to stabilize mood. Just 30 minutes of exercise a day five times a week can have a significant impact on your emotional well-being as well as overall physical health. Honesty. Be honest about your experiences and try to explain what you're going through with your family and friends. Sharing your difficulties can help you and those you love better understand your mood swings and where they are coming from. Be supportive. Women may be going through a difficult time coming to terms with what may feel is the looming end to their womanhood. Therefore, try to understand this stage entails various changes physically and psychologically. Encourage her to seek treatment. Whether it be lifestyle changes or medicines proven to act as mood swing treatments, show support in her decision to seek appropriate help, and assist her through the process as much as possible. Stay positive. This time is just a transition for her, and it happens to every woman. Therefore, attempt to stay positive when dealing with women's mood swings so as not to cause any more unnecessary stress. Do mutual activities. Partaking in activities that both parties thoroughly enjoy can keep you and her mind off of any stress that may have accumulated to this point from her mood swings. Couple relaxation ideas include a spa day, massages, hiking, or swimming. With mutual respect and understanding, all parties involved can learn how to deal with mood swings in a relationship so that it does not end in fights and misunderstandings.